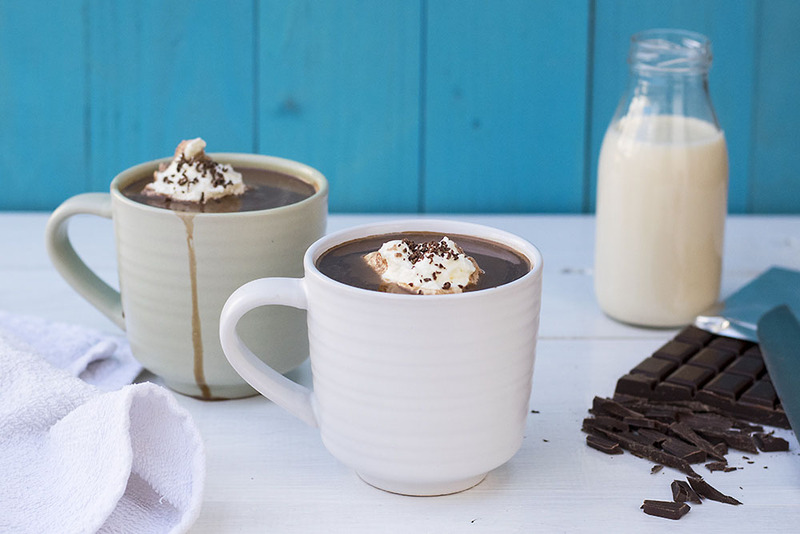 This is my way to make thick, smooth and velvety French hot chocolate. Not with cocoa powder but with real, good quality chocolate. For this recipe, you’ll need a bittersweet chocolate and one that has at least 55% cocoa. If you use milk chocolate the chocolate flavor of your drink will be too faint. Chocolate contains cocoa butter something that means that every time we try to mix it with a liquid we must do it very carefully (think of it like trying to mix water with oil). Otherwise, you will end up drinking warm milk with little bits of chocolate floating all over out mug (I’ve been there). To achieve the perfect consistency you must properly homogenize the chocolate mixture, and the easiest way of doing this is by adding to the very finely chopped chocolate a small amount of hot milk, about enough to almost cover the chocolate. Once the chocolate is melted and fully combined with the milk it will be smooth and glossy. That’s when you’ll start to gradually adding small amounts of hot milk, stirring well after each addition. If you add too much milk at once, the chocolate won’t have the chance to mix properly and you’ll see small bits floating at the surface. 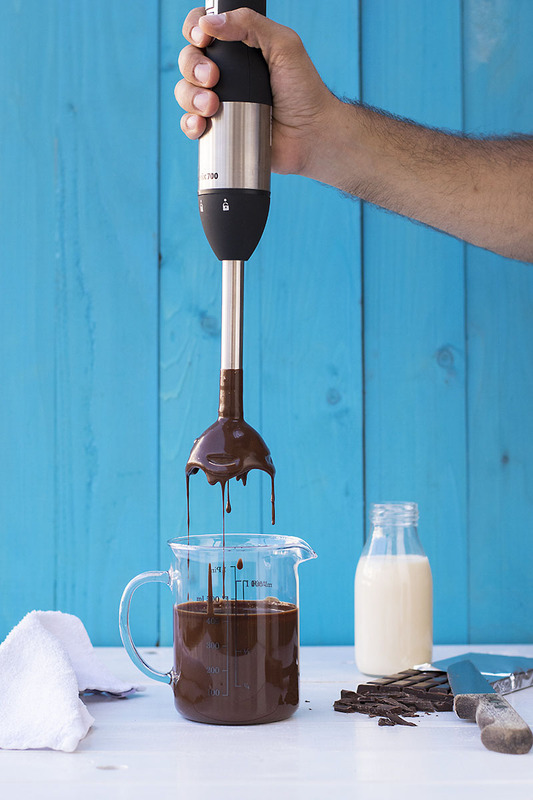 The other way (and probably easier) is to add half of the milk to the chopped chocolate and use an immersion blender to blend it (you can also do it in a regular blender). Then, with the blender working, add the rest of the milk in a steady stream. The only downside of this is that some foam may be created. Why milk and not cream? Whenever I have the chance to use milk instead of cream, I go for it. Cream is sometimes used for a thicker chocolate drink, but this recipe is already thick enough because of the high amounts of chocolate. So no cream is needed here! 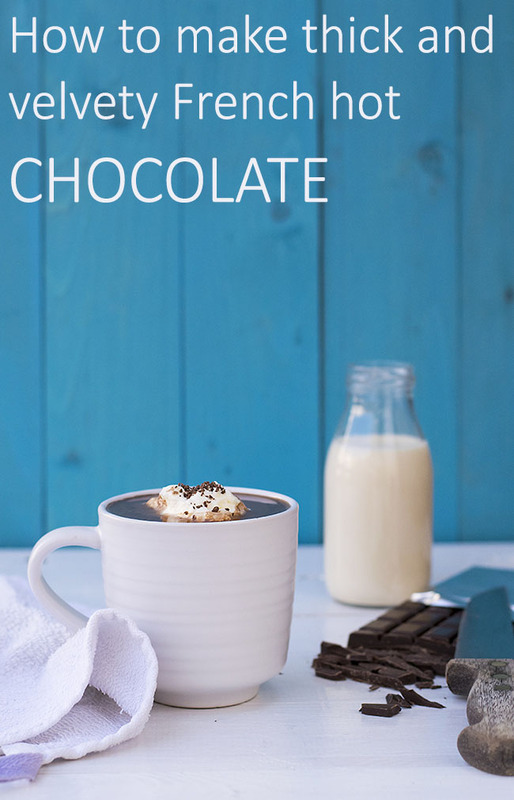 For a truly chocolaty and thick drink, I like to use one part chocolate and two parts milk. But there have also been times when I’ve used less chocolate (like 1 part chocolate and 4 parts milk, measured by weight) and still, the drink was chocolaty enough. The thing about me is that I like to explore tastes and experiment with food. That’s the reason I’ve always had a hard time following a recipe to a T. Even if it’s the first time I’m making something, I’ll either add some extra ingredients I consider appropriate or change something in the quantities. It’s like my hand has a will of its own! Even if I’m making my mom’s amazing spaghetti Bolognese which is one of my favorite dishes and delicious just as is, my hand will spontaneously drop a pinch or two of sweet paprika into the pot or some dried tarragon. And then, it’s not my mom’s dish anymore! Anyway, that’s what I’ve repeatedly done with this French hot chocolate. I’ve added freshly grounded pepper, cardamom, cinnamon, whiskey, brandy, coffee, vanilla, tonka bean, smoked paprika, citrus zest, you name it. And each time I reach the same conclusion: this recipe is better plain, maybe with a little honey if you want it on the sweeter side. By using only milk and a good quality chocolate, you get a true and incomparable chocolate flavor. 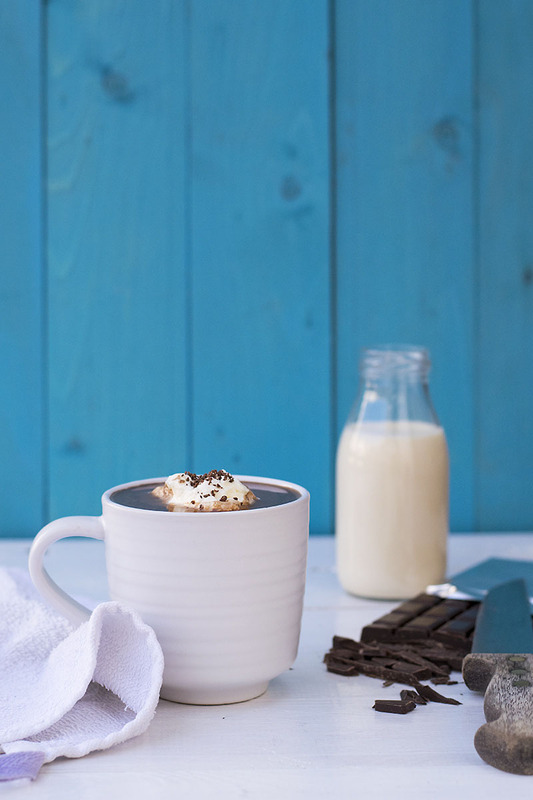 The only addition that makes this hot chocolate drink even better is a little bit of malted milk powder. Chocolate is the food of the gods. You’ve certainly heard this phrase before. It’s due to the fact that the scientific name for cacao/cocoa tree is theobroma cacao from the Greek words “theo” meaning god and “broma” meaning food. I couldn’t agree more! Don’t rush it! Add the hot milk to the finely chopped chocolate gradually for proper homogenization (= smooth mixture). Use good quality, real chocolate! (Check the ingredient list and make sure it has at least 55% cocoa and the only fat is cocoa butter. Chocolate that contains any other fat, such as vegetable fat, is not real chocolate). This recipe is best plain and simple, but you can certainly add the spices of your choice for a nice twist. 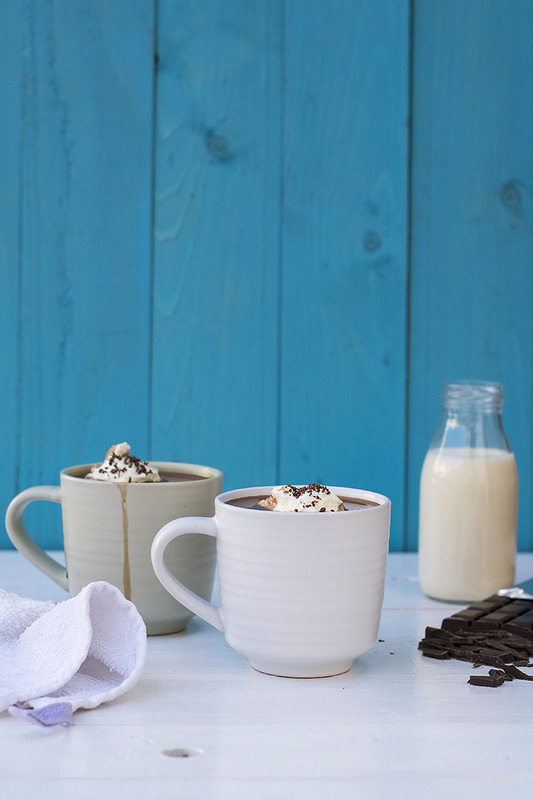 For a prettier presentation, add a dollop of whipped cream and some shaved chocolate. Guys, I hadn’t planned to post this photo, but I had some leftover chocolate and stored it in the fridge (it keeps well for 2-3 days). Just look how thick it became! Heat the milk in a saucepan until very hot and almost boiling. Remove from heat and add the honey and malted milk powder and stir well to dissolve. 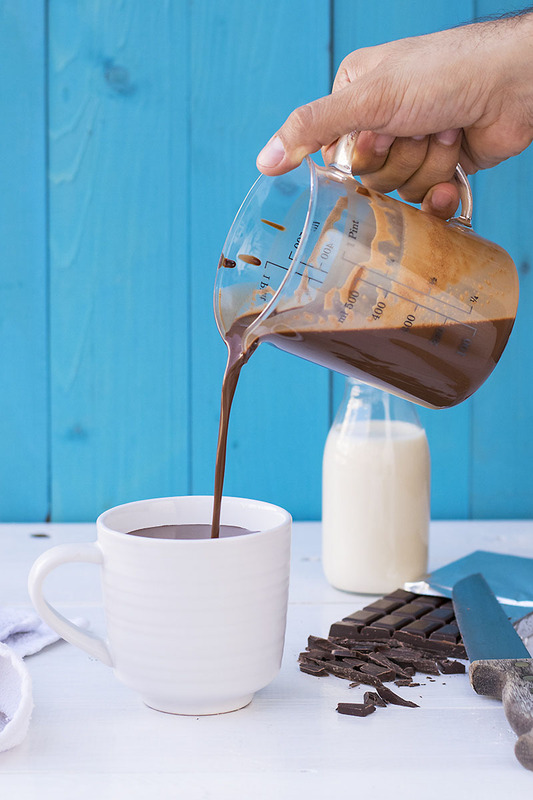 Transfer the chocolate to a large enough jug or bowl and add 1/2 a cup hot milk. The chocolate must be finely chopped and the milk to almost cover the chocolate. Add a little more milk if needed. 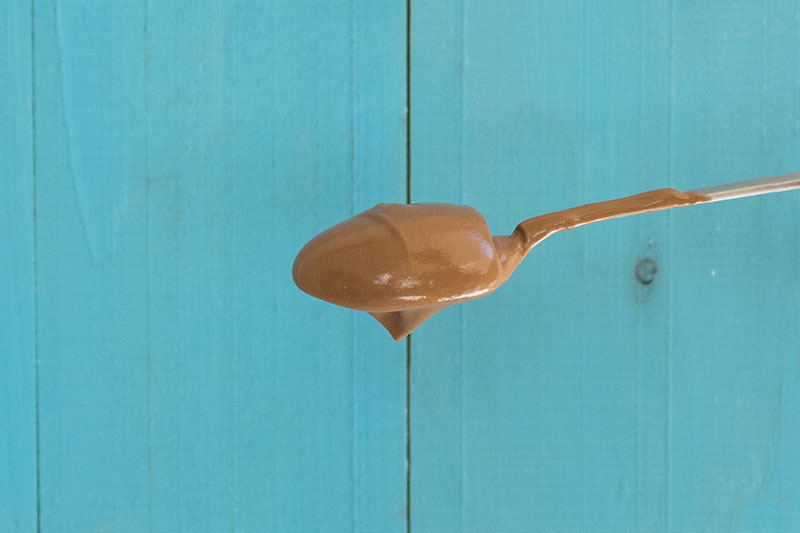 Let it sit for 1 minute and stir with a spoon until chocolate is melted and the mixture is smooth and glossy. Start adding the rest of the hot milk gradually, one tablespoon at a time, stirring constantly. Once the mixture has thinned you can add larger amounts of milk until all the milk is added. Optionally you can garnish with a dollop of whipped cream and some shaved chocolate. For a lighter drink, you can use less chocolate (about 125 grams). In that case, you’ll start by adding about 1/4 cup hot milk and continue according to the directions. this looks so decadent! 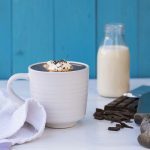 i have to admit that my “homemade” hot chocolate experiences are usually just hot chocolate milk, or hot cocoa, but when it cools down a bit more, i’m all over this. Can you tell me what brand of chocolate you use?